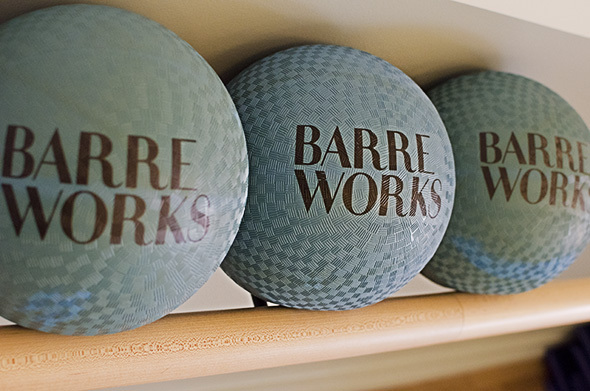 Barreworks studio offers "barre fitness" classes that are based on a popular exercise originating from New York and Los Angeles. 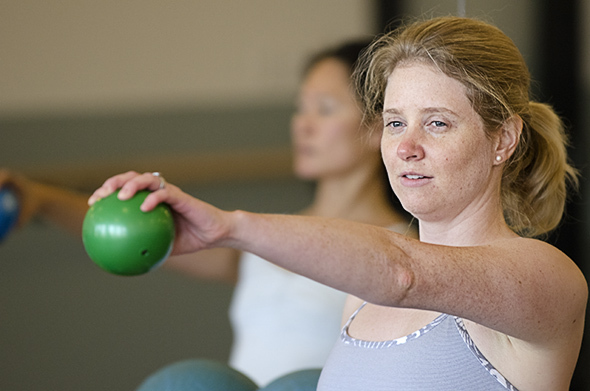 Classes here promise dancer-inspired workouts that combine "fitness training, core conditioning, yoga and pilates into one dynamic class" with an emphasis on using a ballet barre. The novelty of using a ballet barre for the duration of the class is what initially attracts me to try a class at the studio. 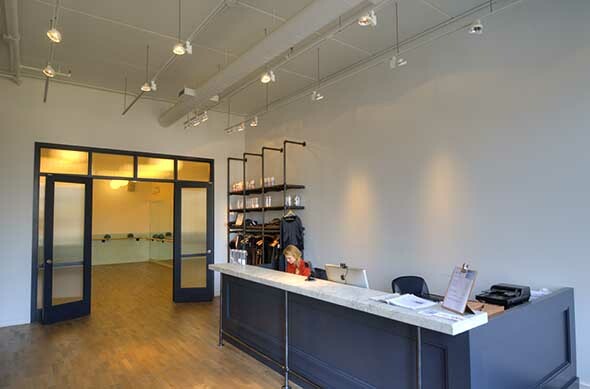 When I arrive at Barreworks, I'm immediately impressed by how pristine and clean the studio is. I feel like I'm standing in the main hallway of a real ballet studio. The front reception area is spacious and uncluttered, with a few ballet-inspired accessories like toe-grip socks available for purchase. 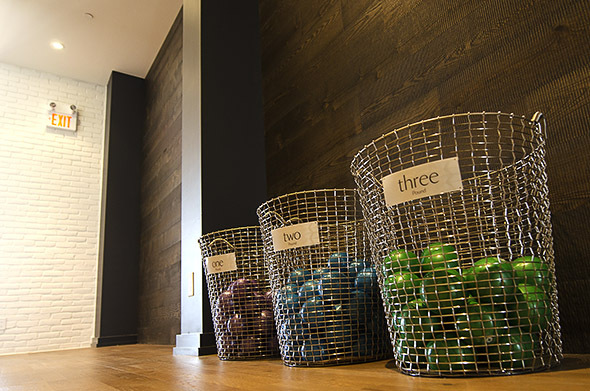 There are two main studios for the Barreworks and yoga classes, as well as a spinning room. The change rooms, like the reception area, are equally impressive. They're clean, spacious, and are fully equipped with showers, lockers, and free use of towels, which makes getting ready for work after an early class entirely feasible. There isn't a 'beginner's class' to attend, so I decide to try their signature Barreworks Mixed Level class, since their website says that no experience or dance background is required to begin. 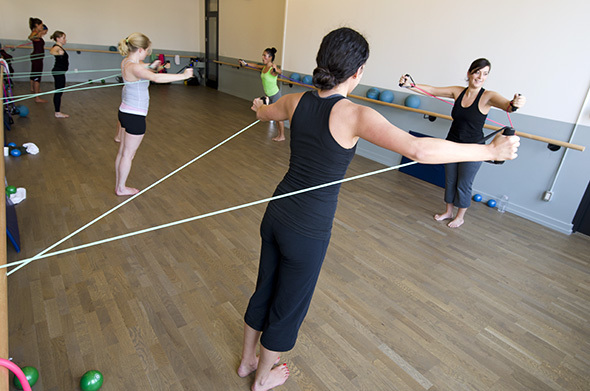 Before we enter the studio, the teacher asks us to choose a resistance band, a weighted ball, and a mat. The studio room is long and narrow, with ballet barres running along both sides. Full-length mirrors are set up across only one side of the room and I decide to pick a spot against the mirror. The class begins quickly, without any formal introductions, and the first two things I notice are how fast-paced the class is, and how difficult it is to hear the instructor over the music. While I appreciate having music in the background of a class, I don't appreciate it when the music volume competes with the instructor's voice - especially when it's a style of exercise that I'm unfamiliar with. As a result, I end up spending a lot of time trying to carefully watch the instructor in order to keep up with the class, since I can't understand her cues. Once the warm up is over, we move to doing a series of squats and lunges using the barres on the wall. Since we're all lined up against the wall, it becomes even more difficult to see the instructor and I resort to watching the other students in the class around me to figure out what I should be doing. Once we are finished with the barre, the instructor leads us onto our mats for floorwork (push-ups, planks, mountain climbs). Each transition feels frantic, and with the instructor moving all around the room, it's incredibly difficult to keep up with the pace of the class. At this point, I've spent more time observing than participating in the class, and I haven't managed to get much of a work out at all. When the class finally ends, I'm left desiring more - a lot more. For a true beginner like myself, I would have preferred if the instructor had spent a couple of minutes before the class introducing herself, giving a brief breakdown of the class so that I could be a little more prepared, and turning down the volume of the music so that I could actually hear her verbal cues. Even suggesting a good spot in the room for first-timers like myself may have made a big difference in my first experience. It may be worthwhile to consider offering 'beginner's only' classes or workshops to help newcomers with zero experience get up to speed on the pace and style of classes offered at Barreworks.